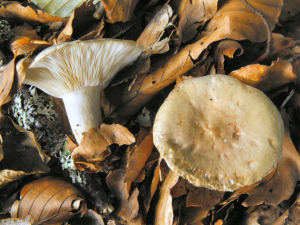 Observation - Beech Milkcap - UK and Ireland. Description: Beech leaves stuck to cap - slightly depressed. Latex white and peppery taste. Dirty white decurrent, crowded. Beech leaves stuck to cap - slightly depressed. Latex white and peppery taste. Dirty white decurrent, crowded.